The New England region was established in 1972 as the very first SCBWI region. For New England residents, membership in SCBWI automatically confers membership in the New England region at no additional fee. Read more about the rich history of our active and busy region. Online NESCBWI Conference Registration is now open. Please check out the conference website at www.regonline.com/nescbwi19 for all conference details in order to be prepared for registration. Explore our new READ LOCAL page! Click on the READ LOCAL menu tab for more information. This the best way to talk directly to other members of the region, and to stay on top of what's going on. 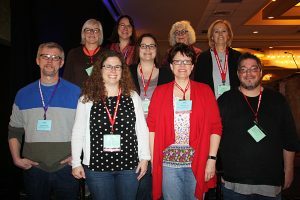 The listserv offers an avenue other than emails directly from SCBWI National for the regional team to announce events and other offerings of interest to our members.